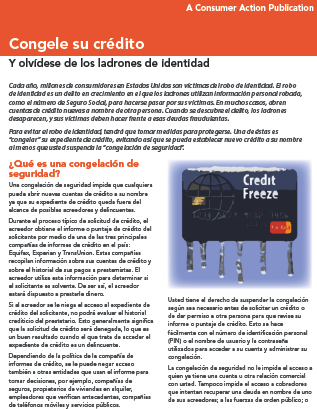 Privacy Information is a project of Consumer Action, a national non-profit consumer advocacy and education organization. The legal right to privacy has been recognized in the U.S. since the late 1890s, but its roots go back to this country’s founding. The Privacy Information Project focuses on personal privacy and why it is important to be careful about who has access to your personal information. 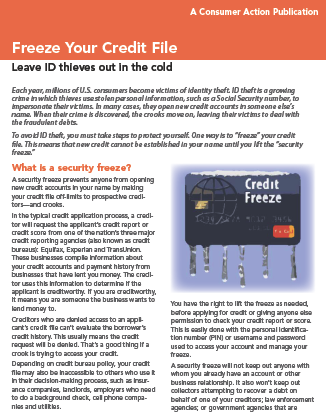 Freeze Your Credit File (Korean) Leave ID thieves out in the cold. 신용 문서 “보안 동결”은 여러분이 신분도용의 피해를 당하지 않도록 하고 사기꾼들이 여러분의 개인 정보를 이용해 신용을 설정하는 것을 방지하는 데 도움을 주는 예방 도구입니다. 보안 동결은 여러분이 일시적 혹은 영구적으로 동결을 해제시키지 않는 한 여러분의 이름으로 새로운 크레딧이 설정되는 것을 방지합니다. 이 소책자는 여러분의 신용 문서를 “동결”시키는 방법을 설명하고 있습니다. 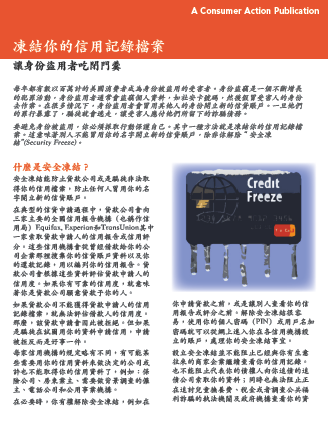 Freeze Your Credit File (Chinese) Leave ID thieves out in the cold. Preparing Millennials to Lead in Cyberspace. Young adults, also known as millennials (ages 18 to 26), hold the key to close the cyber talent gap. Having grown up in a digital environment, millennials are well positioned for these cybersecurity careers, since they are at the stage when they need to choose a profession and will be in the workforce for several decades. This survey reviews U.S. millennials’ career interests, level of career preparedness and their online attitudes and behaviors. Chronology of Data Breaches. Privacy Rights Clearinghouse has been tracking breaches since 2005 and publishes a Chronology of Data Breaches. EPIC Alert. The EPIC Alert, a bi-weekly publication of the Electronic Privacy Information Center in Washington DC, covers issues related to privacy and civil liberties in the information age. Privacy on the Web: Is It a Losing Battle?. Privacy on the web is the topic of this article which examines online tracking, data mining and behavioral advertising. Patient’s Guide to HIPAA. This guide explains how you can use the federal Health Insurance Portability and Accountability Act (HIPAA) to protect your medical privacy.